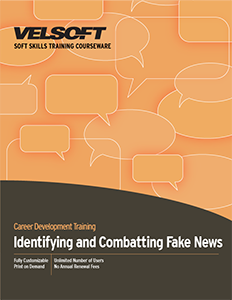 Seeing is Believing This sample manual to teach Identifying and Combatting Fake News is in MS Word format. With fake news becoming more and more prevalent in our world, it’s essential for businesses to know how to recognize it and what to do if they become targets. Fake news can damage the reputation of a business, destroying the trust of the public and clients, and hurting the ability to grow and prosper. But this one-day course will teach how to turn a potential crisis into an opportunity. Like all of our training material packages, each package contains an instructor guide, student manual, advertorial, quick reference guide, PowerPoint slides, and more.